schools & colleges, sports clubs, parcel delivery, shopping centers, swimming pools, Hotels. A wide range of methods to deal with securing guest’s property have evolved over time, securely used by simply presenting a data carrier (card, wristband, or key tag) to the lock’s reader field. Each method has unique strengths and weaknesses. We help you find your balance and the correct fit. 1. Convenience – you never have to worry about carrying around or losing your locking key again. 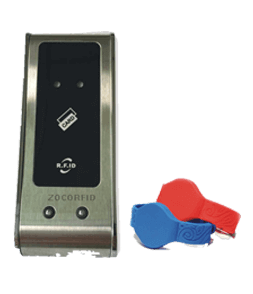 There are no keys to lose with a memorized code for a digital safe lock. 2. Reduced Wear and Tear – Electronic mechanisms are far more durable than physical ones. There’s very little which can be broken or worn out. 3. Better Security – Electronic lockers are very secure as there is simply no access to the lock – unlike mechanical locks which can be lock picked. Setting up burglar alarms is also easier with a digital safe lock. 4. Easy Access – Digital safes use a keypad and PIN where you press the correct sequence for access. This takes mere seconds whereas traditional combination locks require turning the lock one way and the other and read very small numbers at the same time. 5. No More Lost Keys – Any business with lockers will know how often keys can get lost or stolen. With a memorized code, there are no keys to lose. In a key card system, missing cards are much faster, cheaper and easier to replace than cutting a new key. 6. Less Administration – In a manual system, someone needs to look after keys, store them, sign them out and replace them. In an electronic system, you can let the users remember their own codes, reducing wasted staff time and costs. 7. More Visually Impressive – It may seem shallow, but looks count. A room full of electronic lockers can be a lot more impressive and modern than one full of mechanical lockers. 8. Increased Flexibility – Electronic lockers are reconfigured with much more ease than mechanical lockers. The amount charged, the code for each locker, how long it stays locked or unlocked for, etc., are all easily tweaked and tested. 10. Better Analysis – Taking monitoring a step further, you can use analysis to improve your service. Which lockers get used most? When are you operating at capacity? How does locker uptake compare to the number of people using the room? These allow you to plan space utilization, price points and future requirements.